Recognizing the need for a central meeting spot, clubs across the nation have followed suit and constructed and purchased their own clubhouses. Clubhouses have become an integral part of club and community lives, providing a place for clubwomen to work and for their communities to gather. In many cases, clubhouses have also become a shelter for those in the community who have none. GFWC Clubhouses have also come to play a significant role in the preservation of America’s historic buildings. Many clubhouses are situated within historic buildings, such as 1734 N Street, or were constructed by clubwomen at an integral time in American’s architectural history. The hard work and determination of clubwomen has ensured that these buildings are maintained, preserved, and in many cases, placed on state or national historic registers. In our call for articles more than 50 clubwomen responded with stories of their clubhouses and the significance that they hold in your hearts, in your histories, and in your communities. Although we were not able to include every story, these articles represent the accounts triumph, pride, joy, and in some cases loss, that many of you have encountered in the upkeep of your buildings. 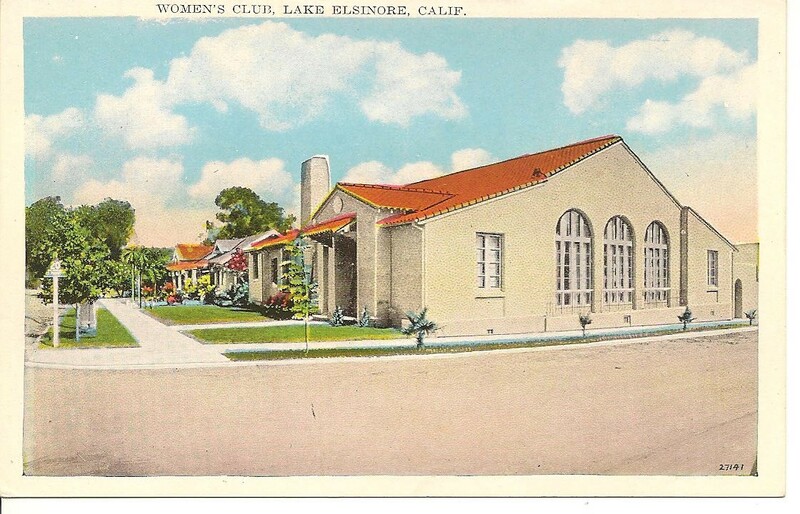 The Elsinore Woman’s Club began construction on their clubhouse in 1920, just 16 years after their formation. The clubwomen constructed a mission-style structure with high ceilings, dark wood casements, a performing stage, and large kitchen and serving area for entertaining. The entire cost of construction was provided by membership and was paid off by the 1940’s through generous donations, fundraisers, and bequests. Today, after more than 112 years of constant weekly service, the clubhouse is a designated California Historic Point of Interest. Over the years, the building has been home to countless endeavors. The clubhouse was lent to political candidates and members of the Women’s Christian Temperance Union to hold community meetings and interact with interested members of the public. Clubwomen also used the clubhouse to host flower shows, art exhibits, quilting bees, medical clinics for immunizations and blood drives, musical performances and seasonal concerts, and countless fundraising dinners. During World Wars I and II, the clubhouse was utilized by the military as well as by the Woman’s Club. Within the walls of the clubhouse, clubwomen taught First Aid, packed gear, learned Morse Code, and hosted letter writing evenings and afternoons for community members. Several Blue and Gold Star Mothers groups also gathered in the clubhouse to remember local young men and women lost in the conflict. In times of crisis, the clubhouse has served as the FEMA center for displaced families to receive information, warm food, and comfort. When the International Parachuting Hall of Fame was inaugurated, the club members used the club as center for food, fellowship, and celebration for the more than 80 representatives that arrived from around the world for the three-day event. Weddings, anniversaries, proms, graduation events, formal balls, community award ceremonies, recitals, banquets, and funeral receptions have all been an ongoing part of the club’s history. Club members have used the clubhouse to serve the community with dignity, diligence, honor, and integrity. Members take great pride in their building that stands as strong and proud as its membership. Since the Woman’s Club of Arlington first formed in 1931, its members dreamed of owning a clubhouse of their own. From 1931-1957, the clubwomen gathered in an old community school. While using the building to host their meetings, the women assembled a small library collection which would eventually grow to become the Columbia Pike Library. After 26 years of meeting in the school, the Woman’s Club of Arlington achieved their goal by opening their own clubhouse on October 6, 1957. Although land was gifted to the club, easements and county assessments forced the club to abandon the original land for the clubhouse’s current location. The mortgage for the building was paid off in three years due to members mortgaging their own homes in order to pay for their clubhouse. Today the clubhouse is still used for GFWC Woman’s Club of Arlington meetings. When the Woman’s Club is not using the building it is rented to music teachers, churches, theater groups, and the Arlington Public Schools. The Woman’s Club of Arlington currently has 34 members and makes an effort to focus on community outreach through volunteer service and working for specific needs in the community. With the realization that meeting space for any group over 50 is cost prohibitive, the club makes a concerted effort to keep rental prices at an affordable rate in order to support local organizations. Often, the clubwomen will sponsor a group as a “gift in kind” for groups that perform extraordinary work within the community. Presently, the clubhouse hosts OAR, the Offenders and Recidivism organization, and offers its clients an opportunity for community service by making Project Linus blankets, sleeping mats for the homeless, and Mended Hearts cushions. The Woman’s Club of Arlington also remains dedicated to the support of local arts. Arcturus Theater recently used the space to finish a five night public performance, and music teachers cross Northern Virginia use the clubhouse for their student’s recitals throughout the year. The Woman’s Club of Arlington is nestled within a residential neighborhood and continues to play a vital role in the lives of their neighbors and their community. The club is proud to possess a property that acts as a living reminder of the women who had the foresight to build a dream. Well into the 20th century, bank accounts, credit cards, and household finances were legally left to the control of men. Women’s lack of financial freedom was one of GFWC’s founder, Jane Cunningham Croly, foundational rallying cries for women across the country. 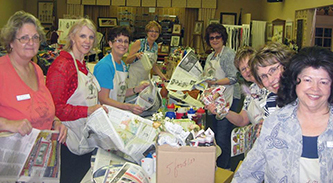 Following the example of Croly, the GFWC Kansas City Anthenaeum took it upon themselves to raise the necessary money to construct a clubhouse of their own. In order to raise the needed funds, clubwomen sold their needlework, canned vegetables, and even charged their husbands for household chores such as completing their ironing or making their lunches. Resourcefully, Anthenaeum members also raised funds by producing extravagant outdoor concerts for their community. By 1914, the clubwomen had raised $50,000 for the construction of a clubhouse. For 101 years, the clubhouse hosted weekly meetings. The building’s four meeting rooms enabled the club to divide its members into different interest groups and committees, and hold simultaneous meetings. The auditorium’s large stage and seating for 300 also offered a venue for community forums and theatrical productions. The commercial-sized kitchen and large dining room enabled the club to offer a luncheon after weekly club meetings. 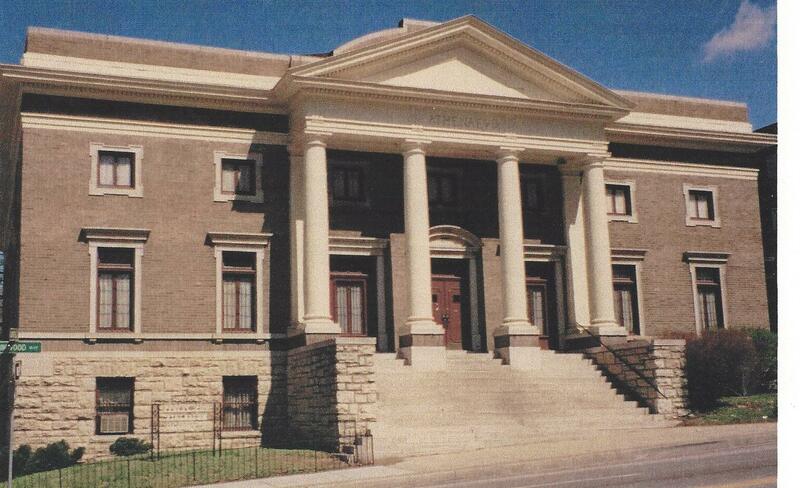 The Kansas City Athenaeum Clubhouse was placed on the National Register of Historic Places in 1979. In 2015 the clubwomen sadly had to sell the building due to mounting costs from vandalism and maintenance. However, the building continues to serve its original purpose by providing space for empowering women, and for philanthropic and community endeavors, through the ownership of the Kansas City Alumnae Chapter of Delta Sigma Theta Sorority. Despite the the sale of their building, GFWC Kansas City Athenaeum members were able to continue to use the clubhouse as a force for good in their community. Clubwomen generously invested the funds from the sale for the purpose of granting annual donations to Kansas City charitable concerns. The Honorable J.F. Downing, prominent business and civic leader, commissioned construction of the mansion located at 259 West Sixth Street as a wedding gift for his daughter, Winifred, upon her marriage to Davenport Galbraith in 1885. Built on land given to Davenport by his father, Judge William Galbraith, construction began in August 1889. 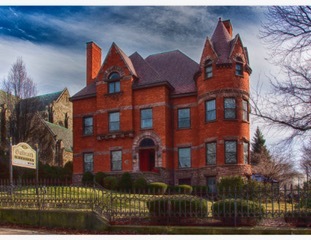 The Richardsonian Romanesque Designed home was completed in 1892 at the cost of $60,000. In July 1921, The Woman’s Club of Erie purchased the home from Mrs. Galbraith at a cost of $60,416.64. The home was officially opened to clubwomen on October 4, 1921. That evening, the club entertained over 600 members and guests with a program, refreshments, and tours of the newly purchased clubhouse. After almost 25 years of striving, the Woman’s Club members reached their goal of owning a clubhouse of their own. The clubhouse is listed on the National Register of Historical Places as part of the West Sixth Street Historic District, commonly referred to as “Millionaire Row.” However, a number of projects needed to preserve the clubhouse have been carried out throughout the years including renovations to the heating system, storm windows, plastering, restoration of the home’s large stained-glass windows, restrooms, and tea room. Currently, funds are being raised to complete the roof restoration project estimated between $150,000 – $200,000. Throughout the years, the clubhouse has proved to be the sanctuary the early members envisioned—a place readily available for meetings, a place where members planned, worked on projects, entertained and met old friends and made new ones. A sample of events held at the clubhouse in include: Christmas in the Mansion, President’s Christmas Tea, Halloween Party, Vintage Collections Weekend, Jazz Night at the Mansion, Themed Winter Dinner, Art Gallery Weekend, Mother/Daughter Tea, Philanthropy Fashion Show & Luncheon, and Murder Mystery Dinner. 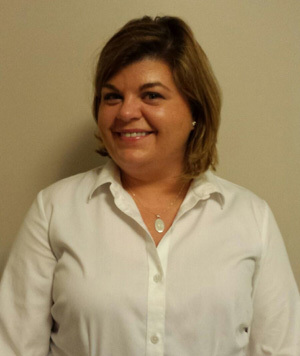 Such activities have fulfilled the original objective “to unite the influence and enterprise of the women of Erie County” and support two annual scholarships, clubhouse preservation efforts, and philanthropic activities. Most recently, The Woman’s Club of Erie was selected as one of six organizations with Preservation Erie’s 2018 Great Erie Awards. Preservation Erie’s mission is to promote, preserve, and enhance the distinctive character of greater Erie through community-based planning, design, and historic preservation. The Woman’s Club was recognized for its exemplary care and preservation of a significant historical asset in the Erie Community. The GFWC Woman’s Club of Laurel, Inc. has occupied the building at 384 Main Street in the Laurel Historic District since 1929. It was in that year that club member Emma Roberts donated the former millinery shop jointly to the Woman’s Club of Laurel and the Laurel Library Association for their common use. The building became home to the first Woman’s Club in Prince George’s County, as well as to the county’s first public library. In 1933 an addition was constructed, adding a brick fireplace which had been specifically requested by Mrs. Roberts. At the height of the depression, the community came together to help the club and library, donating some building materials and free labor to the cause. In the intervening thirty years, the Woman’s Club relinquished its clubroom in the rear of the building to the library to use as their reading room. Despite still sharing maintenance and expense responsibilities with the Library Association, the club was temporarily without a meeting space. The loss of space resulted in the club and the community of Laurel placing pressure on local government to construct a separate building for the Laurel Public Library. By 1967, the library received a new, larger facility, placing the original structure into the care of the Woman’s Club of Laurel. The Woman’s Club launched a massive renovation, and work began on the clubhouse in January of 1968. The first meeting in the renovated building was held in March of the same year. Despite periodic updates, the building has remained functional and current while maintaining its historic charm. Over the past 13 years, the kitchen has been renovated, new flooring installed, and interior decorations have been updated. In addition to hosting club functions, the clubhouse also serves the local community. It has been used as the meeting place for several church groups, is used for an academic prep course each fall, and has been rented by several groups and individuals to host luncheons, showers, and other small meetings and activities. The Woman’s Club of Laurel is extremely proud of their building and its formidable role in Laurel’s local history.